I can just feel the stress starting to build up this week already. I spent nearly the entire day on conference calls, which substantially added to my "To Do" list at work while not allowing me to make any progress against the stuff already on there. Arrrggg! Tonight I decided to try to tackle the stress in a healthy way and go to the gym. I usually try to ride my bike there since it is only a few minutes away, but the weather was getting ugly with a really dark sky. I did not want to get stuck in a rain storm on my way back from the gym. So, I drove. After getting stuck in a line of cars cruising the parking lot for a space, I tried the street for parking. The only spot I could find was at a parking meter that took only quarters. I had no quarters on me. I took this as a sign that I should just return home, andI did. I worked out to a yoga DVD for 45 minutes instead. Ahhhh! I'll just finish here with a soothing photo I took last month in Central Park. Doesn't that look like a wonderful place to sit and relax/read/knit/snooze? I'm going to give this new Vox thing a try since I'm so fed up with Blogger these days. It's such a pain to post photos that I really don't want to blog at all. Since I'm testing out all the Vox features, let's insert a photo from Flickr. Mark and I were in Manhattan a few weekends ago and this was the last photo I took. 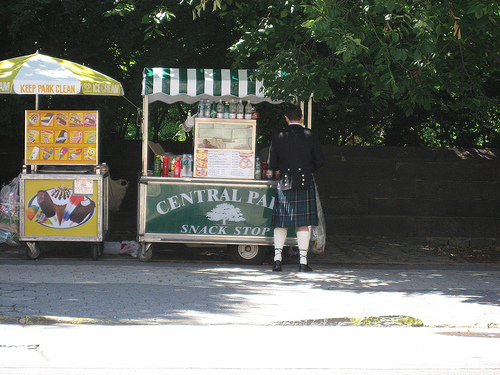 I saw a guy in a kilt walking up to the refreshment cart and just had to sneak a photo. How often do you see a guy in a kilt? Pretty memorable, eh? I mentioned that Jamie and I were going to NYC for the Yarn Harlot’s Represent event. While we encountered a few glitches on the first day, we made up for it the rest of the weekend. Because I am still exhausted, I’m going to cop out a bit and just post the summary I wrote for the Windy City Knitting Guild newsletter. 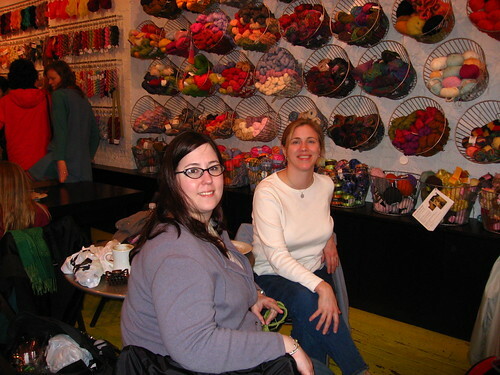 Fellow Guild member Jamie H. and I decided to represent Chicago at the Yarn Harlot’s event and headed off to NYC in the early morning hours of March 22. While we were drawn to New York City for the Yarn Harlot’s event, we just had to sample the yarn shops, too. We visited eight yarn shops in total, all in Manhattan. There may be many fine yarn shops we missed in Manhattan and the outer boroughs of New York City, but just visiting these eight over 2 ½ days was exhausting enough. Further explorations of what the greater New York area has to offer knitters will have to wait for another trip. Weather delays prevented our flight from departing on time and we missed the more intimate gathering of knitters at the Imagine mosaic honoring John Lennon near Strawberry Fields in Central Park. However, we did meet up with many knitters as we yarn crawled our way to the main event at the Fashion Institute of Technology in the late afternoon. Me and Guido from the It’s a Purl, Man podcast at School Products. Despite our delayed arrival on this first day, we managed to visit two veritable institutions as we made our way from the Grammercy Park neighborhood (where we bunked each night) to the midtown Fashion/Garment district where Stephanie Pearl-McPhee (Yarn Harlot) was hosting her big event. The first stop, School Products, is known for its wide selection of coned yarn, and it did not disappoint. There were several tables full of cones and hanks of yarns composed of cashmere, silk, merino, cotton, linen, and various combinations of these fibers. One long table held a selection of hand-dyed hanks and drew a lot of attention. In addition to the tables, the walls were lined with shelf upon shelf of yarn from commercial distributors such as Karabella, Classic Elite, Brown Sheep, and Koigu, as well as books and magazines. 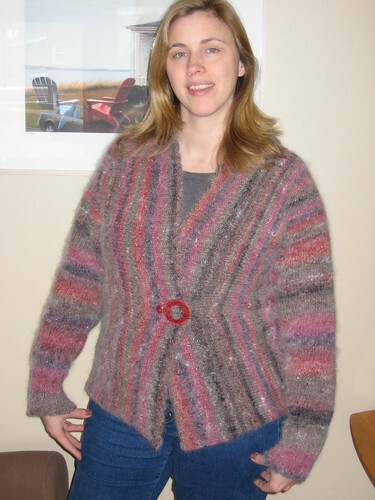 A hand-dyed cashmere boucle proved too precious to resist, as did a couple skeins of Koigu. The next stop was Habu Textiles. Habu is known for producing yarns made of unusual fibers, such as stainless steel and paper, blended with more traditional fibers like silk, cotton, and linen. The small shop was overwhelmed with knitters on this momentous day and proved a challenge to navigate. However, Habu products were found at several other yarn shops in Manhattan. The balance of the afternoon and evening was spent at the Fashion Institute of Technology where we and dozens of other knitters were treated to a guided tour of the Knitting Laboratory by Professor Anne Denton. We then knitted away on our own projects or squares for Warm Up America (using yarn and needles generously donated by the Craft Yarn Council of America) while Stephanie Pearl-McPhee made us laugh and nod in agreement with her observations of how the world at large views knitters. The auditorium was packed with about 650 knitters who were given the opportunity to ask questions and share comments, too. Apparently the sharing went on past 9 PM, although we found ourselves staggering out at 8 PM, famished and exhausted. My friend Harriet took us to Bright Food Shop to restore ourselves with a fabulous dinner. Afterwards, we hopped the 23rd Street bus eastwards and back to our room. I didn’t mention the room in the write up for the Knitting Guild. We stayed in budget accomodations at the American Dream Hostel. Jamie in our room at the hostel. Small, but private and with clean beds. Guess who lost the coin toss and got the top bunk? We had to sleep with the window open otherwise we would have roasted to death. The heat worked very well. Unfortunately, I am not acclimated to the sounds of Manhattan at night, and slept poorly even with my ear plugs. Ah, well, at least we had more $ for yarn. The next morning (March 23), we set out for a long day of yarn shopping by stopping first at Knit New York in the East Village. A cozy combination of yarn shop and café, Knit New York had a balanced selection of basic and novelty/specialty yarns. Shelved neatly next to a large working table was an extensive collection of knitting books for in-store reference, with copies of popular titles for sale. We left Knit New York with a Habu handbag kit and more Koigu (on sale, too! ), then continued on our way downtown. Nestled in the midst of the Wall Street financial district was the most surprising yarn shop I’ve ever visited: Seaport Yarns. Imagine walking into a typical small office suite: reception area, small conference room, and offices strung along a central corridor. Now, imagine that in each of these areas exists shelf upon shelf of yarn, knitting books, needles, and other knitting products. One of the friendly ladies noted that Seaport was originally a market research company, and that they still serve some clients in this capacity. How they can perform their research while knitters wander into their office to view the selection of Anny Blatt is beyond me! Seaport calls itself “the yarnaholics candy store,” and it more than delivers on this promise. The conference room was full of Louet products, while yet another room was devoted to sock yarns and needles. Several minutes into the “tour” we queried: Is there anything they don’t carry? After a few minutes of thought the response was Blue Sky Alpaca and Koigu. The shopping possibilities were limited by one idiosyncrasy: Seaport takes only cash and checks, no credit or debit cards. I found the clearance and sock rooms irresistible, and picked up several skeins of soy silk with an unusual chained construction (hopefully enough for a camisole), as well as a hank of Colinette’s new Jitterbug sock yarn. My final haul also included some Diakeito, a multi-colored and plied Japanese yarn that will make lovely socks, and a wool/cotton blend sock yarn by Steinbach Wolle in irresistible sherbet-like shades. We caught an uptown subway to SoHo where we took a much-needed lunch break before stopping in at Purl. For a small shop, Purl really packs in the yarn, and from floor to ceiling the walls are a scrumptious combination of color and texture. The popular book Last Minute Knitted Gifts was written by the owner of Purl, and it’s a treat to see the actual projects displayed in the store. Natural fibers are the focus of Purl’s inventory, and we were sorely tempted by some luminous yarn by Pear Tree. We escaped with a generous skein of Jade Sapphire silk/cashmere in a most unusual frosty shade called Silver Fern, a small skein of Habu cashmere nep, and a couple more skeins of Koigu. Finally, we wrapped up Day 2 at The Point, a knitting café just a few blocks north and west of Purl. The selection of yarns was not as overwhelming as Seaport and Purl, and we leisurely explored in between sips of coffee and bites of pastry. Before we knew it, the afternoon was well-advanced and the after-work crowd began filtering in. The Point is open until 8 PM on Friday nights, and it was obvious that these knitters were regulars meeting up to stitch and mingle. We were welcomed in their midst, and wound up staying nearly until closing. Just enough time to finish one pair of socks and begin another. Hanging out at The Point Knitting Cafe. Saturday morning (March 24) we visited the Radical Lace and Subversive Knitting exhibit at the Museum of Arts and Design on our way uptown. The exhibit was a fascinating combination of whimsical and awe-inspiring artwork in a variety of media. The Madison Avenue bus took us further uptown to String, the ultimate luxury yarn shop. Nearly every skein on display contained cashmere and was a tactile delight. 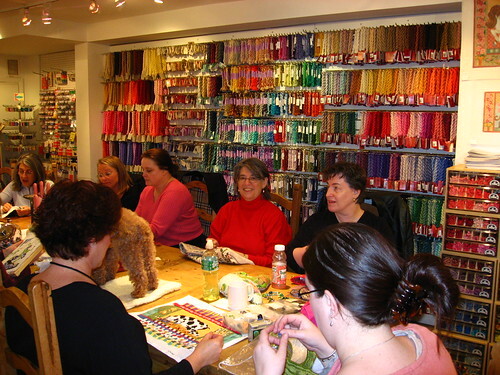 For a few hours, we took a break and enjoyed a visit with some stitching friends on the Upper East Side at Annie & Company Needlepoint. While not a yarn shop, the stitching ladies welcomed us to their large table in the center of this bright and warm shop for a bit of lunch and conversation. Within the next few months, Annie & Company will be opening a yarn shop, too, and we’re sure to make time to visit on our next trip to New York City. The friendly stitching ladies at Annie & Company. Finally, we crossed Central Park and wrapped up our yarn crawl at Knitty City on the Upper West Side. Upon walking into the store, we were immediately drawn to a table containing large hanks of Fleece Artist Sea Wool, a sock-weight yarn made of machine-washable merino and sea silk. Apparently, the yarn had just arrived that day and we had our pick of several hand-dyed colors. Knitty City was a warm and welcoming shop with a great selection of basic and luxury yarns, as well as an extensive collection of books and magazines. When we left the store over an hour later with our precious Fleece Artist yarn, a signed copy of the new Friday Night Knitting Club book, and a copy of Wild Fibers magazine, we also had a recommendation for a fine Italian restaurant we dined at that night. After such exhausting travels on previous days, we were more than happy to spend our last day (Sunday, March 25) lounging in Central Park with our knitting for several hours before heading to the airport and back to Chicago. While we weren’t able to visit every yarn shop in Manhattan, we’d visited enough to get a good “flavor” for the town. 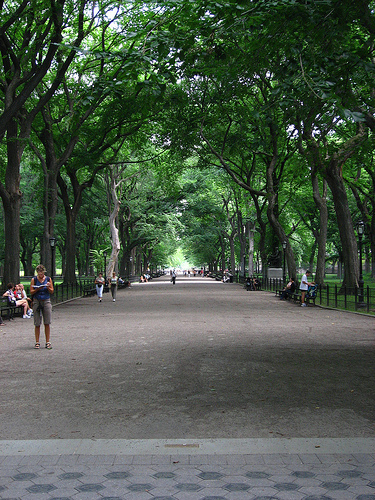 Now whenever I think of New York I’ll also think of Koigu, since I encountered so much of it there. The most important thing learned while yarn crawling through New York? No sales tax on yarn! Photos of the trip may are available on Flickr. Jamie took photos at many of the yarn shops and posted them here. More of my photos are available here.